Here's a nice quick card, and it really works well for any occasion. 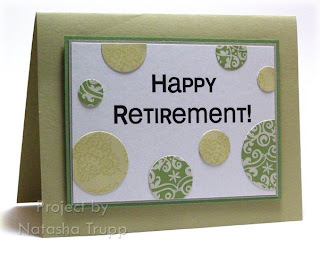 This card just happens to be for a retirement. I don't have a really nice retirement stamp, so I just went into Photoshop, and chose one of my favorite fonts and printed out a few different sizes all over some white card stock. I chose my favorite one, then cut it to a card front proportion size. I wanted to use some specific patterned paper, so I chose that, then chose my cardstock colours accordingly. Next, I ran the papers through the cuttlebug with the smallest circle nestabilities I own, then positioned them all around the sentiment. I popped that up with pop dots (of course!). I even had a few circles to spare, so I adhered some inside the card as well. This card also works well for a monochromatic card. 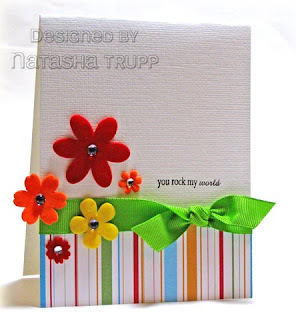 Using the same hues on a card can have a really stunning effect. Monochromatic colour schemes are always a good go-to for clean and simple style cards. It can also help speed up the process, since you are restricting yourself to using only supplies of a certain colour. For my card today, I went with PINKS! In keeping with the feminine theme, I stamped a few purses, then coloured them in with pencil crayons. I went searching for some nice pink patterned paper. Would you believe that I don't have any that matches Pixie Pink or Pink Passion very nicely? 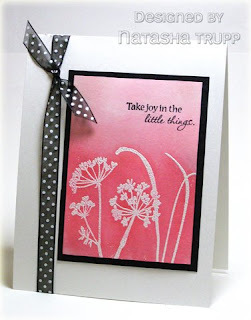 So, I stamped a few small flowers on some Pink Passion instead. Just as good! My bow was inspired by the one on the right-most purse. 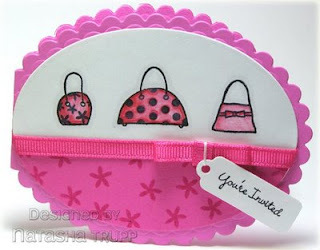 I added a little sentiment tag, and voila, a cute little invite for a girl's night out! Another brief CAS tip for you, shaped cards can really jazz up your card. What might be a bit dull or too small for a normal 4.25x5.5 card can really work on a smaller shaped card! 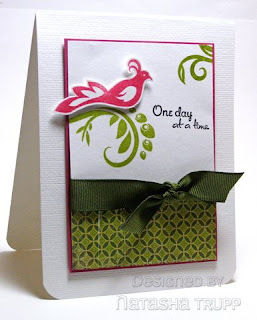 I used the corner rounder on this card because it compliments the corners of the Dreamweaver stencil I used. To color the image I used small stipple brushes and stippled on the colors from SU! dye ink pads. Then I used clear embossing paste over the stencil. After lifting off the stencil I sprinkled Art Institute Crystal glitter over the paste and let it dry. I used a part of an Ornare piercing template on the corner. 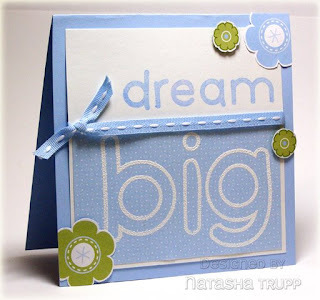 Before mounting the panel with pop dots I used my Cuttlebug embossing folder to emboss the sentiment. 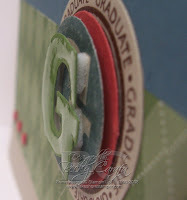 The DCWV cardstock has a white core so I sanded the sentiment so the white would show. Supplies: Dreamweaver stencil, SU! dye inks, stipple brush, embossing paste, temporary tape, glitter, Cuttlebug embossing folder, pop dots, sanding block. I decided to use the colors from Tuesday's SCS color challenge when I made this card: Tempting Turquoise, Glorious Green and White. For added texture I used the Cuttlebug embossing folder on the base of the card and used my Scor-pal to emboss the diamonds on the tempting turquoise panel. I stamped the flower randomly in glorious green on the white panel and added the two image panels and an epoxy sticker. 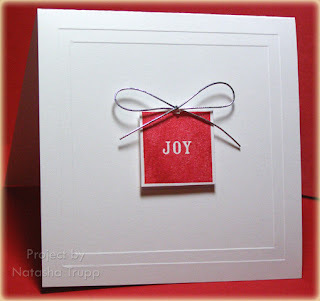 Supplies: Stamps - Hero Arts; Paper - Prism CS, PaperTrey Stampers Select, Michaels; Ink - SU! Glorious Green, Tempting Turquoise; Misc - dimensionals, SEI epoxy sticker. This layout is a bit different then some, but I saw a card with it somewhere, and found it to be inspiring. I thought I'd give it a shot, and share it with you. Plus, it goes well with the idea of using white or blank space. The optional part is exactly that. If you find the card looks too empty, feel free to add something in there, if you want a simpler card, leave it empty. The circle next to the sentiment can be any sort of embellishment, button, brad, knot, anything! A few measurements that you might find helpful... The lowest layer (on my card the patterned paper) is 3-3/4x2-1/2. The light pink is 2-1/2x 3-1/4. 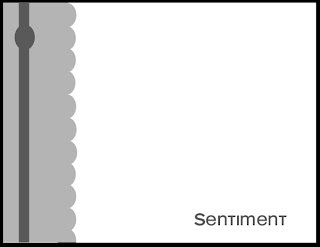 My sentiment strip is 3 inches long. 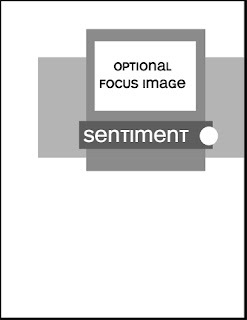 Finally, the optional image part is 2-3/8x1-3/4. Some other details for my card- all stamps are by PaperTrey Ink (Eat Cake, Birthday Basics), the paper and ink are mostly from there too (Berry Sorbet and Sweet Blush, as well as the patterned paper). 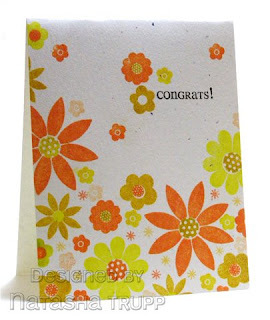 Confetti white paper is from Stampin' Up!, as is the Rose Red button. I also went over all the Berry Sorbet cake layers with a clear Spica marker. If you do decide to take a stab at the layout, feel free to leave a comment here, or use the keyword FTL4 at SCS! 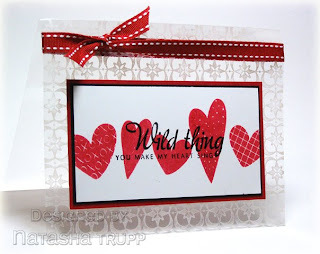 One item that can definitely work to your advantage when creating CAS style cards is white space. Now white space doesn't necessarily have to be white in colour. Essentially it's the absence of stuff. My example is one I made back in the winter, but I think it really provides a good look at the "less is more" type of style. One thing I've noticed, not so much in cardmaking, but definitely in scrapbooking, is that the use of white space on pages is very popular. There's just something very cool and graphic looking to a project that makes use of all that space to bring your eye to the desired focal image. I made this card before I had the square nestabilities. I used some cardstock- a 3-1/4 square and a 3-5/8 square as my templates. With a light table, it is easy to center the cardstock templates . The card base is 4-1/4. 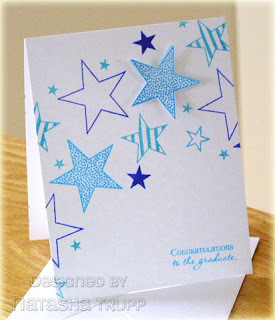 Amazingly enough, there were no stamps or ink used in the creating of this card! I used the Messenger Accents & Elements kit. I bought it months ago and this was the first time I used it. It worked perfectly for Fall-to Layout #3. The sentiment is from the SAB rub-ons, Love & Happiness. I adhered a strip of ruby red cardstock and a strip from A&E on a 4-3/4 x 4-1/4 white card base, stuck the flowers on, added some centers to the flowers, and rubbed on the sentiment. Super quick! It's time for another fall to layout. This one uses the clustering method that I discussed on Sunday. The sketch is pretty self explanatory, the shapes can be any shape. The idea is that they should be of a similar theme though. The thin strip could be ribbon or a thin strip of paper. 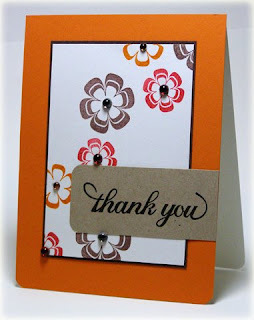 I like having a large amount of white or blank space on the top, then adding the sentiment on patterned paper below. If you decide to play along, feel free to add a link here, or use the keyword FTL3 at Splitcoast. I love the depth that using pop dots gives to an image or panel of a card. 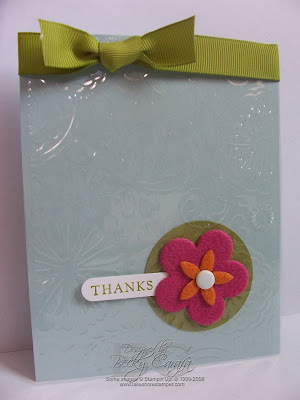 For this card I used the pop dots to layer parts of the flowers. I stamped and water colored the image on the PaperTrey Stamper Select cardstock. Then I stamped the flowers again on another piece of the same cardstock, water colored them, then cut out different parts of the flowers and layered them on the original stamped and colored image. I used Nestabilities to cut out the image and the scalloped mat and the Cuttlebug and Swiss Dots embossing folder to emboss the front of the card. I left off embellishments because I wanted to focus on the beauty of the magnolia flowers. Supplies: Stamps - Lilac Set from Flourishes; paper - PaperTrey Ink, Bazzil; ink - Pallette Burnt Umber; Misc. - watercolor pencils, aquabrush, Spellbinders Nestabilities, $1 store pop dots. Today is all about pop dots. These small items can really add a lot to any project. One recommendation I have for pop dots is, once you find a good source to buy, pick up LOTS. My local Dollarama carries several types. They are available in large squares, small squares, large circles and small circles. You get at least 384 of the small squares on one sheet for $1.00, so it's a pretty good deal. They stick well and are a nice thickness. Anyway, my point is, once you find some you like, stock up. These can add the perfect "pop" to any card. Today's card was inspired by this wonderful gift set by Jennifer McGuire. She's a wonderful artist in both card making and scrapbooking. A lot of her stuff fits into the clean and simple, but WOW! style. If for some reason you haven't checked her stuff out before, here's her blog link. For my card, I used pop dots both to pop up the butterfly, as well as to pop up the entire pink layer. I was inspired to use piercing and stitching, so I got out the piercing guide for the frame, and I got out the dental floss for the butterfly trail. The green scallops were made with a slit punch. Stamps come from Verve Visual (butterfly) and PaperTrey Ink (saying). Every so often, I'll be focusing on a technique that I find works well with the CAS style. For this one, I'm going a bit "old school", in more ways than one... Pull out that glossy paper and white crayons, maybe a brayer or a few sponges- it's time for White Crayon Resist. This technique is super fast, and it looks pretty cool. Decide on an image theme and your colours and you're all set to go. For this one, I started with some flowers from PTI's Beautiful Blooms set. I stamped them, then added in some white lines with the crayon. Next, I got a sponge and started wiping mustard and burgundy all over. I finished it off with a small frame, some matching ribbon, and a sentiment. One of the great things about this technique is that you could stamp a whole sheet of these, then cut it up and make a whole bunch of cards like the style I've posted here. The colors Natasha challenged with were Really Rust, Chocolate Chip, Ruby Red and white for a neutral. At first I thought Autumn but was not feeling in an autumn mood! So I decided these colors would make a good silhouette at sunset. I inked up the leaves image with Versamark, then chocolate chip and stamped the image. I embossed it with clear embossing powder. I sponged on the really rust, then the ruby red and a little bit of chocolate chip. I cut the image and mat out with my long rectangle nestabilities. 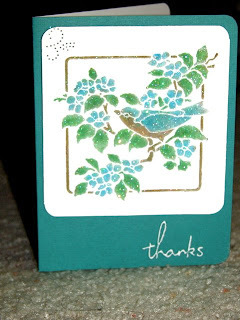 I used DCWV cardstock which has great texture and some SEI patterned paper. I felt it needed a little something to complete it so I stamped the butterfly on the left over sponged paper, cut it out, mounted it just on the body so that the wings could be bent away from the paper. I finished it off with an Amuse Twinkler sticker. I left room for a sentiment in the lower left corner of the image. This week's "fall to" is a bit different, instead of a layout, I've got a colour palette. Sometimes even just a colour scheme can inspire you to make a good CAS card. The fall-to colours are one of my favorite combinations. They are earthy, but bright. The colours: Ruby Red, Chocolate Chip, Really Rust, and neutrals (I used both white and kraft on here). 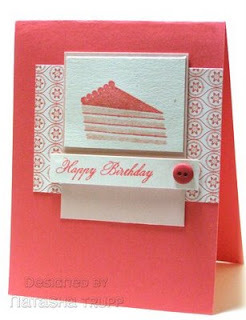 Supplies: Stamps all by Verve Visual, Ink and Paper by Stampin' Up!, gelly gems by gelatins, corner rounder by Stampin' up! 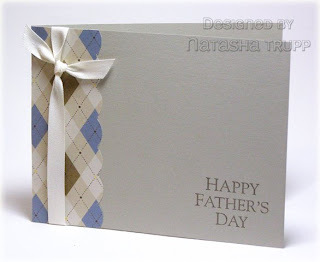 I started with a white textured 5x5 card base, and adhered two patterned paper pieces to it. I attached a third strip of patterned paper across the whole card and added silver brads to anchor it. The Thickers "thanks" finished it off! This is a "texture" card, but I also made it in less than 10 minutes. Today's CAS tip is all about texture. I was only going to focus on my card base being textured, but once I got started, I kept bringing in more and more textile items. A textured card base can really bring a lot to a card. Simply by choosing a textured paper, you've added interest to the entire card. 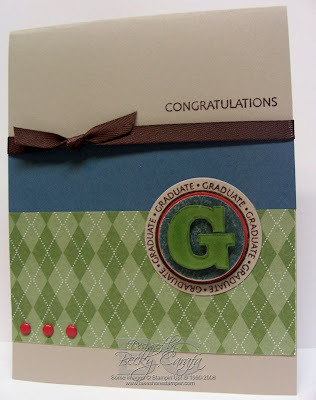 There are lots of textured card stocks out there, and the great thing is there are tons of colours to choose from! Like I said, once I got on the texture kick, more items came out. I brought the striped paper, which is kind of a wannabe texture. 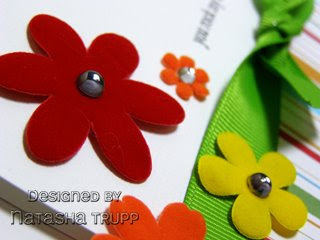 Next came the ribbon, then the felt flowers, and finally the bling. All these items reach out to the recipient. So the next time you're needing a quick card that packs a bit of a "wow", consider using some textured cardstock as your base. It really adds a little something special! Here I have used the transparency as an overlay, after I ran it through my Cuttlebug with an embossing folder to give it some texture. I adhered it at the top of the card base, then tied a ribbon to hide the adhesive. The olive circle is adhered to the back of the transparency to hide the adhesive of the flower and sentiment. For this card, I stamped the swirl on the transparency card base with white Stazon, then layered on the circles and ribbon. Three halfback white pearls add a finishing touch. Transparencies are one of those supplies that has all sorts of creative uses. You can use it for card bases, for overlays, or for gel cards, just to name a few. It's definitely one of those items that's good to keep around. There are also varying thicknesses available, so you need to be aware of what kind of acetate works best with your intended use. I've found that photocopy quality acetate is a well-rounded one to keep around. It's heavy enough for card bases or boxes, and you can heat emboss it. I picked mine up at an office supply store. If you're looking for a heavy weight type, I know that both Flourishes and Cornish Heritage Farms carry them. Anyway, enough babble, onto the card! I used a transparency for my card base. I stamped the front with a background stamp using White Stazon, added some ribbons, and my stamped image matted on coordinating colours. Quick, clean, simple! 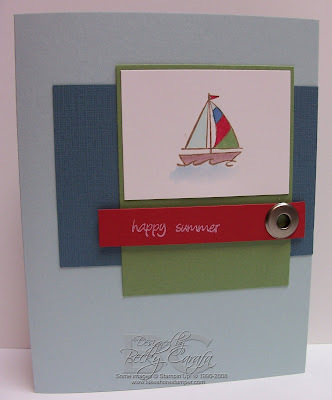 Ink and Paper: Stampin' Up! Here's my card for this week's fall-to layout. I decided to go for something a bit masculine, because I just received this new twill tape today. I found some masculine patterned paper and paired that with a sahara sand card base. I know people don't typically associate ribbon and scallops with masculine cards, but if you choose the right kind of ribbon, and the right kind of paper, it works! Ribbon from Dunwoody Booth Stamps, Ink, and Paper from Stampin' Up! 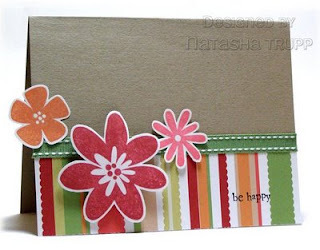 Here are some examples using Natasha's Fall-to layout 2. This was a fun, easy and quick sketch to use. I am generally slow at making my cards even with a sketch to follow but I made 7 of these very quickly! I like how versatile this sketch is - it looks great in portrait or landscape mode, and on a rectangular or square card. 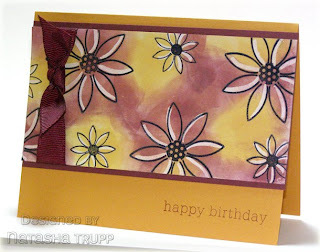 Materials: Cardstock - PaperTrey; Patterned Paper - SEI Dill Blossom, PaperTrey; Ink - SU! Chocolate Chip; Accessories - SU! HodgePodge Hardware, Cuttlebug. It's time for another sketch that you can try out immediately or save into your book of sketches! This one is really great for when you're needing that ultra quick card! It's also great if you're needing several cards or if you're making a gift set. 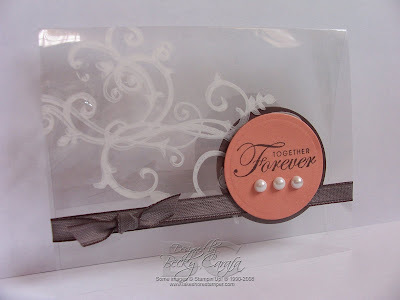 The scalloped section can be patterned paper or other coloured cardstock. The darker strip can be a knotted ribbon or anything else you deem appropriate. Again, the bubble is a nice place for the knot or an embellishment because it brings balance to the whole item. Harriet has some wonderful examples with this sketch. She shows how easily it can be used for any orientation or shape! First off, I wanted to start off my post with a welcome to a few people who will also be sharing their CAS creations on this blog. Give a warm welcome to Harriet Skelly and to Becky Carafa. I love their approaches to the CAS style, and I hope you will too! This week's CAS tip is mixing text sizes and fonts. I have found this to be a really effective way of getting a message across, while keeping the card quick, clean, and simple! 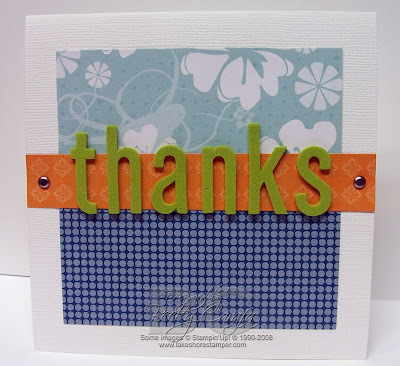 There are all sorts of amazing sentiment stamps out there. Several companies already make the mixed size and font of sentiments, but it's also nice to put together your own using different alphabet sets. I find that when I make the card all about the greeting, all you really need are some nice papers, some ribbon, and maybe an embellishment or two, and you have a great card! I've got two cards for you today. The first features a pre-mixed sentiment from Verve Visual. The second card features a mix of alphabets to get a fun greeting. This one actually features the same font, but the difference in size and style still makes for an interesting looking sentiment. This was a card that I had absolutely no intention to make today. Suddenly, I needed a graduation card though. I had ten minutes before dinner would be ready. I felt a challenge coming on! I quickly decided that stars and blues would be my images and colour scheme. 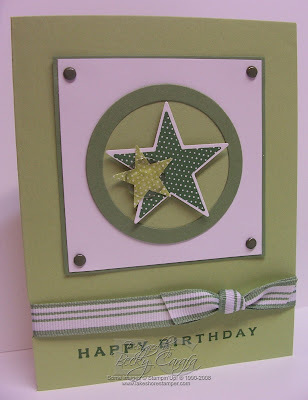 I cut my card front and began stamping in a "swoosh" like pattern across the card front. I added in the sentiment, but still had time to spare. 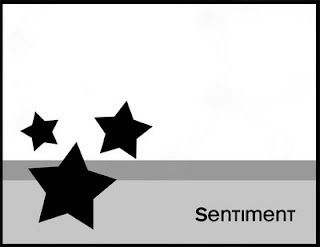 So, I stamped another star, cut it out and placed it over one of the stars. I didn't time myself exactly, but I finished with a few minutes to spare! All stamps are by Verve Visual.